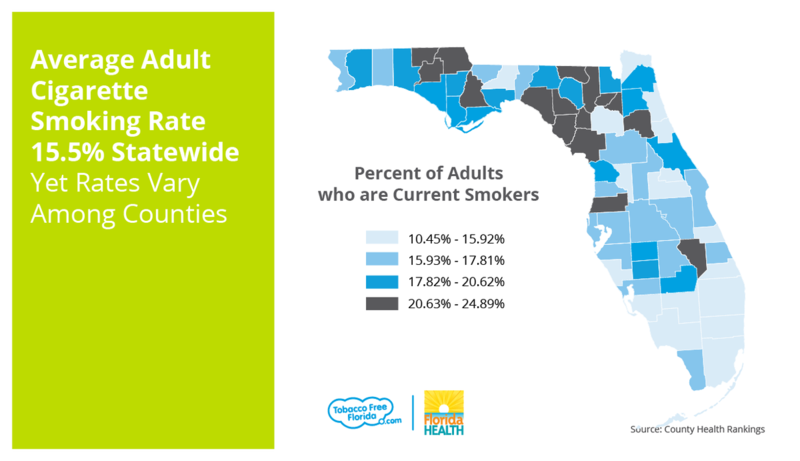 Sandra Averhart reports on the 2018 Tobacco Free Florida Week awareness campaign, including a new initiative focused on smoking-related disparities in the state. Tobacco Free Florida Week is taking place through this Sunday, April 8. The 2018 observance marks the tenth anniversary of the Florida Department of Health’s Tobacco Free Florida Week. This year the campaign is focused on curbing smoking in certain populations and features the launch of a new initiative called Achieving Health Equity. “We really want to raise awareness about tobacco-related disparities in the state, but also promote our messaging that we have free and evidence-based tools available to help decrease some of those disparities,” said Tobacco Free Florida Bureau Chief Dr. Kellie O’Dare. Currently, nearly 2.5 million, or 15.5 percent, of Florida adults are cigarette smokers. The rate for African Americans is 13.1 percent, and 12.2 percent for the Hispanic population. Both are below the 4.4 percent statewide smoking rate for whites, which O’Dare says is a bit misleading. According to the most recent County Health Rankings from the Robert Wood Johnson Foundation and University of Wisconsin Population Health Institute, the adult smoking rate locally is about 17 percent in Escambia and Okaloosa counties and 19% in Santa Rosa. In all three counties, the greatest disparities are less about race and more a matter of income and education level. Zimmermann, who is also executive director of the Santa Rosa Healthy Start Coalition, finds that race is a factor when it comes to her work with pregnant women. Statewide, tobacco use is also higher within the LGBT community and among adults with poor mental health. O’Dare says one factor for the disparities among the various minority groups is exposure through a strategy called “point of sale” marketing. 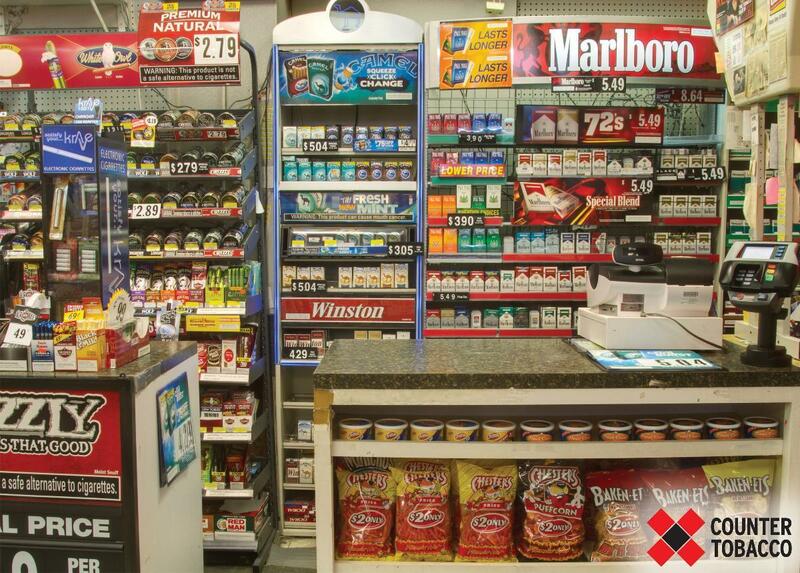 This is when marketing or advertisements are available to consumers when they walk into a location where tobacco products are sold. “So there’s a higher density of retailers who sell tobacco products in communities with higher proportions of African Americans, Hispanics, people living below the poverty line, women who are older than 25 years old and those without a high school diploma,” she said. Point of sale tactics can include discount coupons, direct-mail coupons, and the development of products that directly appeal to certain groups. This is an example of tobacco marketing that is prevalent in stores in certain minority communities. Further, O’Dare says studies indicate there are about double the number of tobacco retailers in lower income neighborhoods and those where people with higher incidents of mental illness live. She says it appears that the state’s anti-tobacco messaging is either not reaching or is not effective with particular populations. And, she says they’re hoping to address that with a new ad campaign being launched this week. “The new campaign is called the reasons, and we have worked with real Floridians who will take us thru their life story and their experience about their tobacco use,” explained O’Dare. One of the six new commercials features Geremy Jackson, an African American, with his young family at their modest home in Madison. “Quit Your Way” provides Floridians with a variety of tools to help them successfully kick the habit, including “quit” coaching by phone, internet, text, and email, as well as in person cessation meetings and nicotine therapy replacement. The new “Reasons” TV commercials are designed to encourage more people to find their own reasons to quit and O’Dare says they will follow up to see if it’s been successful. “So after we roll the campaigns out, and they have sufficient time to generate interest and hopefully generate quit attempts, we have independent evaluators to go in and look at the effectiveness of these campaigns, if they’re doing a good job at the target populations,” O’Dare said. In addition to cessation resources, prevention programs such as the school-based Students Working Against Tobacco - or SWAT, are key components of the Florida Department of Health’s state and local strategy to reduce smoking. Statistics show there is still work to be done, especially among specific populations. But, since the Tobacco Free Florida program was launched in 2007, about 200,000 individuals have successfully quit smoking and all-totaled there are about a half million fewer smokers in the state. 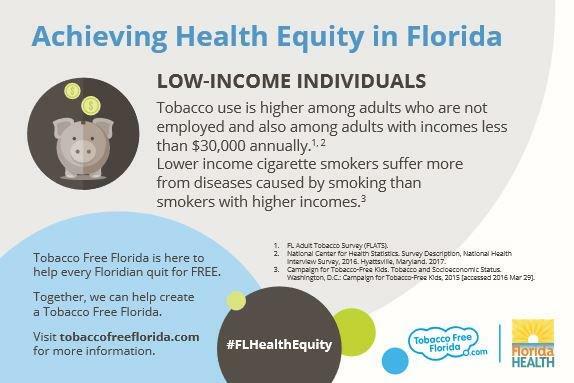 Find out more on Twitter by following #FLHealthEquity and on the Tobacco Free Florida Facebook page.